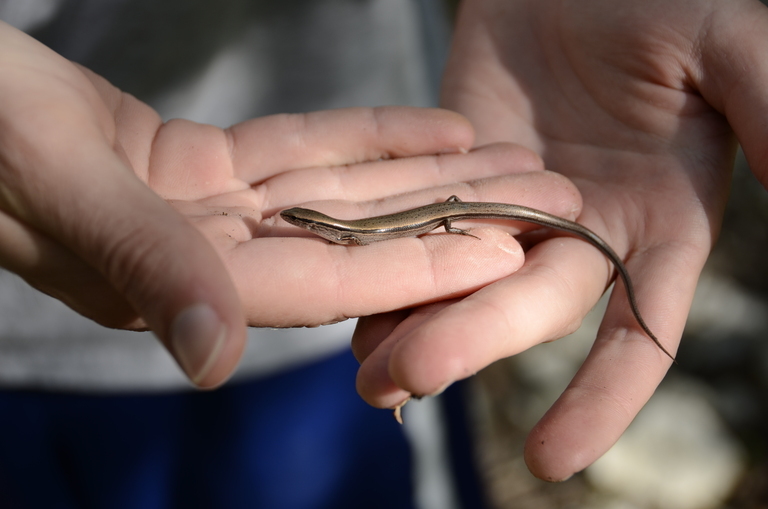 Can you confirm these amateur observations of Scincella lateralis? Distribution USA (Texas, Oklahoma, E Kansas, S Missouri, Arkansas, Louisiana, S Illinois, S Indiana, S Ohio, Kentucky, Tennessee, Mississippi, Alabama, Georgia, Florida, South Carolina, North Carolina, Virginia, Maryland, West Virginia, Delaware, New Jersey). Types Syntype: USNM 3152, Mississippi River below Cape Girardieu, Cape Girardieu County, Missouri, collected S.W. Woodhouse (identified as holotype by Cochran, 1963). No specific locality given in type description, which is based on specimens observed by Say during the expedition's passage "down the Mississippi to New Orleans", and which "proved to be specifically indentical with specimens which I formerly collected in Georgia and East Florida", although the description is given in a footnote in the Expedition's report at the time of its stay in Cape Girardieu. Say also stated that the largest specimen seen was lodged in the "Philadelphia Museum". 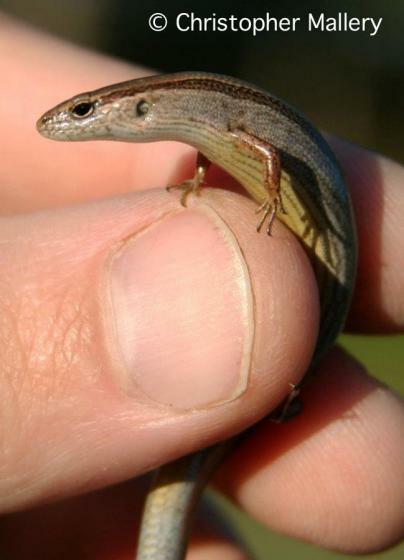 Diagnosis Diagnosis (genus): This genus is differentiated from other sphenomorphines by its small size, attenuate habitus, terrestrial behaviour, postorbital bone which is usually long and thin, and a transparent window in a moveable lower eyelid (Greer 1974). 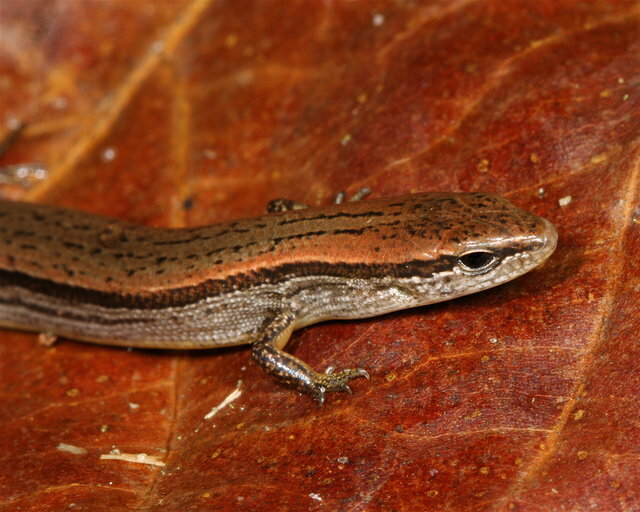 Note that the lower eyelid with a transparent or opaque window is found in several genera of Asiatic skinks: Asymblepharus, Leptoseps, Lipinia, Paralipinia, and Vietnascincus (Darevsky & Orlov 1994, 1997, Greer 1997, Eremchenko 2002, Shea & Greer 2002). An important diagnostic character of the genus Scincella is the presence of a transparent or an opaque window on lower eyelid (Boulenger, 1887; Smith, 1935; Taylor, 1963; Greer, 1974; Ouboter, 1986). 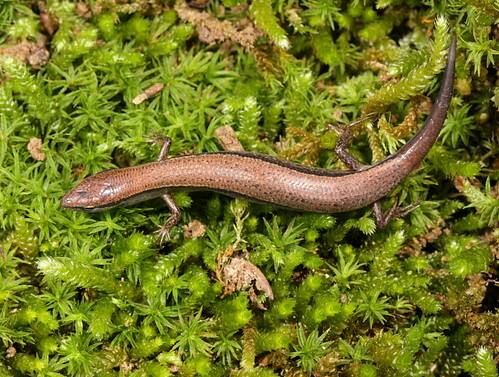 However, this feature is also found in several genera of Asiatic skinks: Asymblepharus, Leptoseps, Lipinia, Paralipinia, and Vietnascincus (Darevsky and Orlov, 1994, 1997; Greer, 1997; Eremchenko, 2002; Shea and Greer, 2002; Greer and Shea, 2003). Description: Scincella can be diagnosed by the following combination of characters: (1) body size medium (SVL usually < 65 mm); (2) alpha palate (Greer, 1974) with nine premaxillary teeth; (3) long, thin postorbital bone usually present; and (4) with a transparent window in a movable lower eyelid. 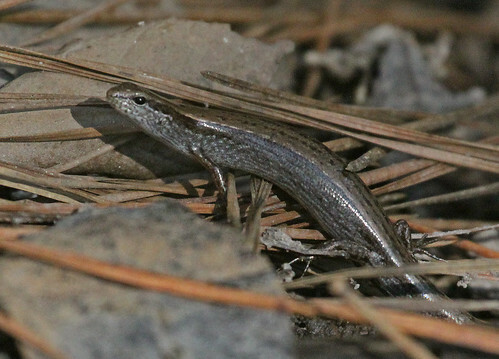 Transparent window may be lacking in southern populations of Sp. cheerei [LINKEM, DIESMOS & BROWN 2011]. 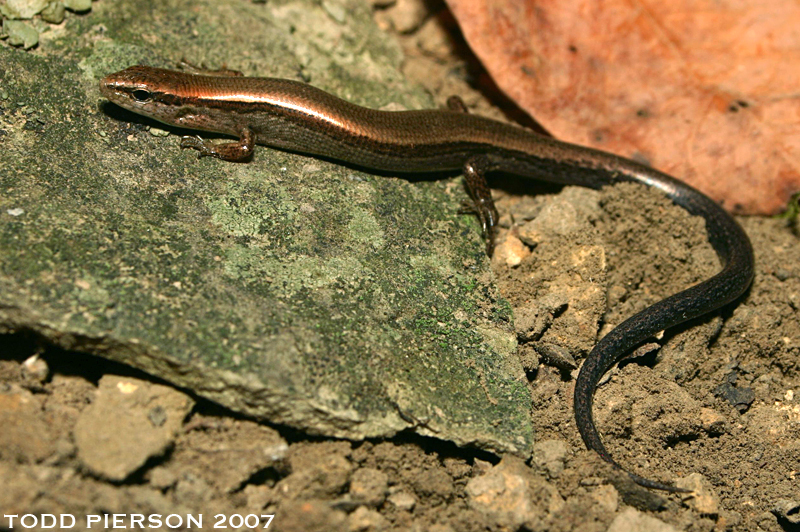 Scincella species are characterized by their small size, elongated body, short limbs, relatively long tail, smooth subcycloid scales (most species), small oblong head with transparent disc in a movable lower eyelid, absence of supranasals, pentadactyl hindlimbs, one row of basal subdigital lamellae (most species), median preanals overlapping lateral ones, four or more scales bordering the parietals between the upper secondary temporals, and lower secondary temporal overlapping the upper one (diagnosis follows Greer & Shea, 2003; Lim, 1998; Nguyen et al., 2010a, 2010b, 2010c). 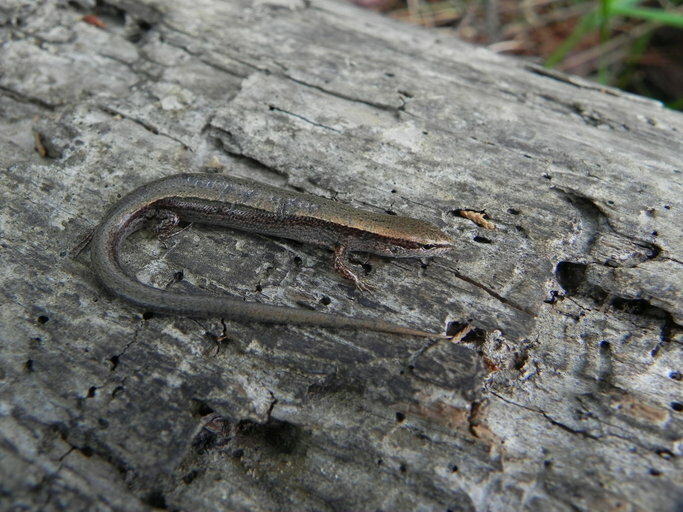 Furthermore, the genus Scincella is differentiated from closely related Sphenomorphus Fitzinger by the presence of a transparent window in the lower eyelid as opposed to lower eyelid covered with polygonal scales in Sphenomorphus (Greer, 1974; Nguyen et al., 2010a) [from Neang et al. 2018]. 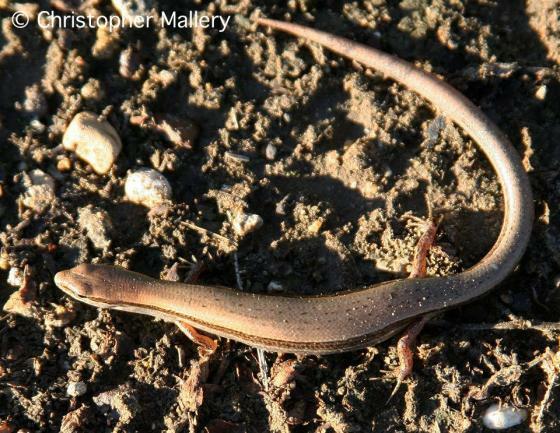 Comment The taxonomy of Scincella lateralis has been confusing because of the similarity of North American and Asian forms and because of the resulting nomenclatural confusion. Therefore, the synonymy presented here has to be taken with caution. 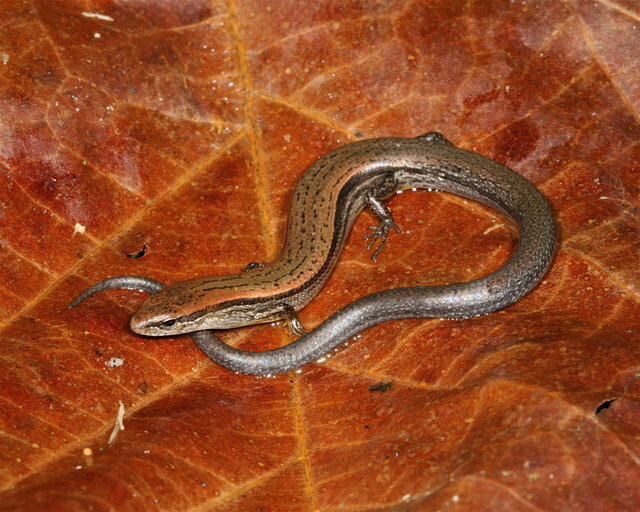 Type species: Sincella lateralis is the type species of the genus Scincella MITTLEMAN 1950 (fide GREER 1974). Distribution: Not in Nuevo León fide Nevárez-de los Reyes et al. 2016. 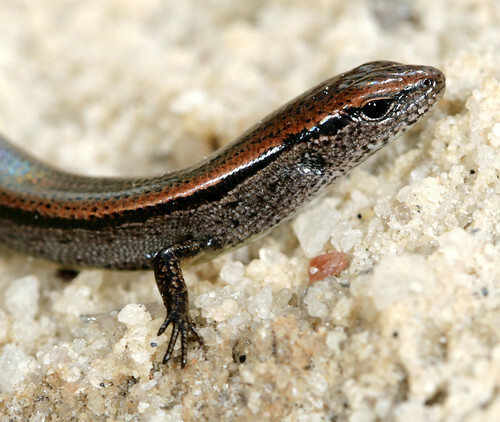 Etymology The generic epithet is derived from the Latin word scincus, meaning "skink," and the suffix -ellus, meaning "little," and thus combined meaning "little skink." Jordan 1899. 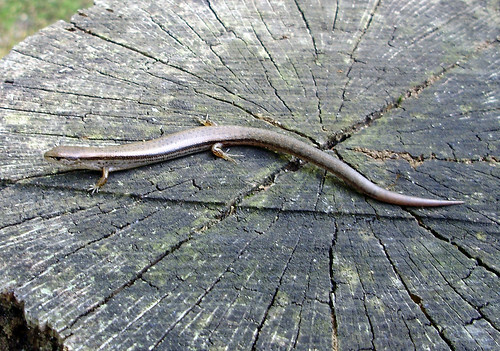 Manual of the vertebrates of the northern United States, 8th ed.